Last August, IMAX cinemas around the world screened a special preview of Avatar, James Cameron’s first narrative film since Titanic (1997), sketching the story in a quarter-hour of footage. Here’s our human hero, the wheelchair-bound former marine Jake Sully (Sam Worthington, from the underwhelming Terminator Salvation). He’s on Pandora, a world of giant trees, great birds and beasts, floating mountains and hostile natives called the Na’vi. It’s as daring a world as the mattes-and-miniatures Skull Island in the first King Kong (1933), only presented in stupendous depth and detail to fill the largest IMAX screens. In a laboratory, Jake projects his mind into a customised Na’vi body, an Avatar. It has blue skin, a tail, and it’s ten feet tall, so the orderlies have no chance when he starts to run around in it. In Pandora’s forest, Jake faces Jurassic-sized versions of rhinos and lions. Then a beautiful and bestial female Na’vi (played with gusto by Zoe Saldana from last year’s Star Trek) leads him through a luminous fairyland that JM Barrie might have recognised. The preview ends with Jake facing dozens of snarling winged monsters on the brink of a bottomless cliff, then taming one of them and taking flight. 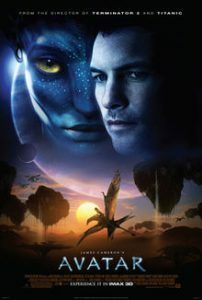 Avatar’s script frequently alludes to dreams, but the film isn’t an ode to the fantastical imagination, like Pan’s Labyrinth (2006) or Le Voyage dans la Lune (1902). Rather, it strives to put the viewer on Pandora for “real.” Cameron literally grounds the film through the details; Jake joyfully kicking up the dirt on his first Pandora run, or the grass blowing wildly under a military ‘copter as it lands in the wilderness. The latter image is a startling reminder of the grown-up real world, though Cameron says his inspirations were the “manly, jungle adventure writers” of past generations: Edgar Rice Burroughs and H. Rider Haggard. In Avatar’s most vivid moments, the characters seem uplifted from stereotypes to archetypes: Worthington’s blunt hero explorer, invigorated in body and spirit by Pandora’s wonders; the exotic Na’vi tiger-woman, leaping into a firelit glade and loosing an arrow in mid-air. The Na’vi are created with motion-capture; that is to say, they’re human actors converted into CGI figures. When The Polar Express (2004) used the same approach five years ago, its characters were panned for looking inhuman. Conversely, Avatar‘s flat-nosed, fluorescent-skinned aliens could almost be actors with unusually good Star Trek prosthetics. One reminder that this is motion-capture is the presence of Sigourney Weaver, who starred in Cameron’s Aliens (1986) a quarter-century before. In Na’vi form, she seems magically rejuvenated back to that time, albeit with blue skin and a tail. Avatar’s story is based around rebirth, from the opening moments when Jake sees his twin brother cremated, then steps into his sibling’s shoes to be “twinned” with the alien Avatar. When he meets the Na’vi woman, called Neytiri, she calls him an ignorant baby. The rest of the story shows Jake growing into his new species, until he finally speaks of humans as aliens from “a dying world.” It’s all a respray of the hero-going-native myth, but the literalism of Cameron’s fantasy gives new screen power to the metaphor, as we see bodies rebuilt and synthesised. The army grunts steer giant anthropomorphic robots; the Na’vi bio-bound with Pandora’s flora and fauna. There are more blatant transpositions. In a ballsy central set-piece, the villainous humans bring down the Na’vi’s towering tree-home in a cascade of smoke and debris. This is a 9/11 perpetrated by American firepower, and its obviousness doesn’t belie the skill with which the reversal works dramatically and thematically. Of course, Avatar is post-colonialist fantasy, with the forest-dwelling Na’vi as Native Americans; but it’s also Saint Paul in space, as Pandora’s Gaea-goddess chooses Jake as her instrument. Unlike most effects blockbusters, the multiple story resonances give Avatar true sequel potential, as cheekily hinted in the larger, unnamed planet looming in Pandora’s background. Avatar may be destined to become the biggest critical hate-object since Star Wars (1977), its inanities and howlers inflated by its outblown hype and budget (reportedly somewhere between two and five hundred million dollars). Actually, its truly terrible moments are few but damaging: some ghastly dialogue and info-dumps, and a campy vision of the Na’vi’s swaying religious rites, which evokes the mosh-pit celebrations in The Matrix Reloaded (2003). A much more serious problem is the slack and inane middle act, in which Jake bonds with the Na’vi and Neytiri in scenes reminiscent of a bad Disney song montage. When I saw Avatar in full, I found myself willing Cameron to cut to the chase, and take us up to the dragons’ precipitous clifftop-lair, in the heady, sublime pulp territory that he’s now definitively conquered.